Real Madrid forward, Cristiano Ronaldo, has spoken of his “pride” in recent individual achievements, including a fifth career Ballon d’Or trophy and becoming the leading scorer in Club World Cup history. Ronaldo equalled Barcelona’s Lionel Messi by winning the Ballon d’Or for a fifth time earlier this month. He also recently picked up the FIFA The Best prize for 2017 for a second consecutive year. 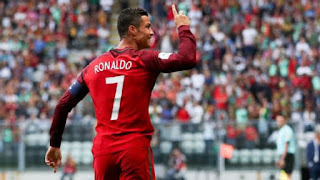 On Wednesday in Abu Dhabi, the Portugal captain scored his sixth goal in six games in the Club World Cup in the 2-1 win over Al-Jazira, moving ahead of Messi, Barca’s Luis Suarez and ex-Monterrey forward, Cesar Delgado, who have all found the net five times in the competition. “I am very happy and proud, first of all for my football career, principally at Real Madrid. “Winning my fifth Ballon d’Or and becoming the top Club World Cup scorer for me is a motivation to keep working happily and with sacrifice,” Ronaldo told RMTV from Abu Dhabi.